I received the following email from cyclist Ken Adams Sunday night, relating a dangerous encounter with a CHP officer who buzzed their bikes, then came back to argue his apparent misunderstanding of California bike law. I’m trying to spread the word of my experience yesterday as far and wide as possible, because it was quite unbelievable and extremely dangerous. I don’t know if you’re familiar with the roads I mentioned, but they are very popular cycling routes, especially for Saturday morning rides. I was riding with a friend, starting from his house in Glendora. 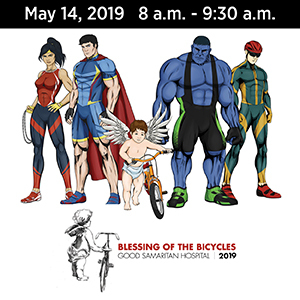 There was another training ride with about 9 people starting from a coffee shop in Glendora that I was aware of because of an event invite on Facebook. We started our ride just after 8 am. We started the climb on GMR at about 8:15. At approximately 8:30, about 2-3 miles North of Sierra Madre, a CHP SUV passed us dangerously close – probably about 2 feet away. Neither of us gave the incident much thought, as it happens frequently, although it is unexpected from law enforcement. A few miles later, the same CHP vehicle was stopped and the officer had exited the vehicle. He was standing on the shoulder and commented something to the effect “watch out, there are cars coming up”. We turned and looked, but saw nothing. We assumed he was referring to some type of event that was occurring, so we were extra vigilant. We never saw any unusual vehicle traffic – in fact, traffic was unusually light for a weekend. We continued riding, past East Fork road, where GMR becomes GRR. Approximately 13 miles from the previous incident, the same CHP SUV passed us again, this time much more closely. He was no more than 1 – 1.5 feet from us. At that point, the road was straight, there were clear sight lines for at least ½ mile, no oncoming traffic and we were riding single file on the white line. There are also no lane demarcation lines painted on the road, as the road is less than 2 lanes wide at that point. Subsequent to this incident, we continued our ride. We encountered additional riders and described our experience with the CHP SUV. Incredibly, they told us they had experienced the same thing. When I returned home, I went to the FB event page I mentioned earlier and posted about my experience, asking if anyone else on that ride had experienced an issue with a CHP SUV. I got a number of responses from cyclists who had either witnessed or experienced brushes from this same CHP officer. It is my opinion that this officer had some type of agenda yesterday. He either has some type of antipathy towards cyclists, was trying to prove a point, or was trying to provoke a confrontation that he hoped would escalate to the use of force. Even in a best case scenario, as you can ascertain from viewing the video, he is woefully misinformed about cycling laws and vehicle interactions with cyclists. Most troubling to me was his cavalier attitude about endangering my life and the life of my friend. He seemed completely unconcerned, not to mention excessively arrogant. I was riding my bicycle on Glendora Mountain Road and Glendora Ridge Road on the morning of 7/11/2015. At approximately 8:30 am, on Glendora Mountain Road, about 2 miles north of Sierra Madre, a CHP SUV with license plate number 1365395 passed me and the cyclist with whom I was riding with significantly less than 3 feet (I’d estimate about 2 feet). We continued riding and at approximately 9:55 am, on Glendora Ridge Road, approximately 13 miles from the previous incident, the same CHP SUV passed us again, barely missing us, by approximately 1 foot. The officer continued on for some time, then turned around and returned. We flagged him down and had a conversation with him. We have a video of this interaction, which I would be happy to share with you. I would like to point out that Glendora Ridge Road is a very desolate spot with minimal vehicular traffic. The road is less than 2 lanes wide and has no lane demarcation lines painted on the road. At the point we were passed by the CHP vehicle, there was no oncoming traffic, the road was straight with clear sight lines for at least 1/4 – 1/2 mile and we were riding single file on the white line. 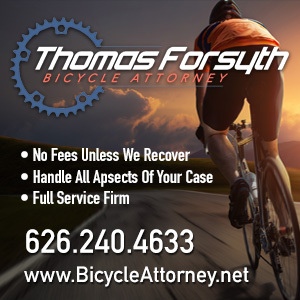 During our conversation, the officer claimed that he must drive on the right half of the road and that he “cannot violate a law to follow a law” when asked about California’s 3-foot cycling law. He seemed completely unconcerned when I pointed out that he had just needlessly endangered my life. In the course of the rest of my ride and subsequently via social media, I learned that this same officer passed numerous other cyclists dangerously close during this same time period on the same stretch of road. This officer endangered my life twice, the life of the person I was cycling with twice, at least 4 other cyclists that I’ve been in contact with and who knows how many others. I suspect this type of aggressive and unsafe driving behavior is not what you expect from your officers. This incident has significantly affected my trust in the professionalism of the CHP as an organization. Cycling on California’s roads is sufficiently dangerous without our law enforcement officers adding to the danger. I sincerely hope that this officer receives some additional training on correct and safe vehicular interaction with cyclists, because it is clear that he currently is lacking in this area. I would very much like to get the dash cam video from his tour yesterday, as I’m sure it clearly shows his two assaults on us, as well as the numerous other assaults on other cyclists. This officer is a menace to cyclists and needs to be dealt with, swiftly and harshly IMO. It is bad enough when Joe Citizen behaves this way. It is completely unacceptable when law enforcement does. The LA Times crunches the numbers, and identifies LA County’s most dangerous intersections. According to the story, just 1% of intersections account for 25% of pedestrian collisions; chances are, those same intersections are just as dangerous for people on bicycles. And bike lanes could be part of the solution, along with other traffic calming efforts. They also report LA Mayor Eric Garcetti will announce a Vision Zero plan next month to eliminate traffic fatalities in the city within 10 years. The question is whether the city is really willing to make the hard choices necessary to get there. After all, they can’t even get bike lanes promised in the unanimously approved 2010 bike plan installed on Westwood, Lankershim and North Figueroa, thanks to roadblocks thrown up by a few councilmembers. Chris Froome keeps the lead in the Tour de France, as his Team Sky finishes just one second behind BMC in the team time trial; the injury riddled Orica-GreenEdge team tanks it. Cycling Weekly offers five talking points following Sunday’s ninth stage. Chris Froome continues to lead, but Teejay van Garderen is just 12 seconds behind. The New York Times looks at the unexpected success of Eritrean riders at the Tour, while WaPo explains why it matters. Mayuko Hagiwara becomes the first Japanese woman to win a stage at the Giro Rosa. Meanwhile, it looks like the Tour de France’s La Course stiffed some of the women competing in last years race out of their already ridiculously low prize money. And US women sweep the bronze mountain biking medals in the Pan Am Games. Am I the only one who didn’t know the Pan Am Games were even going on right now? A teenage boy was shot and killed while riding his bike in the Florence neighborhood of South LA. Something that’s happening far too frequently these days. Bike Metro posts a photo of what looks like secure bike parking at the Beverly Connection shopping center on La Cienega. Another bike rider has been hit by a car in Newport Beach; fortunately, he’s in stable condition. Thanks to John McBrearty for the heads-up. 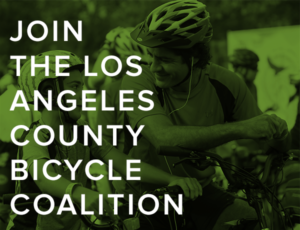 The Orange County Bicycle Coalition urges you to sign a petition to preserve plans for a Class 1 bike trail through Peters Canyon. CSU Fullerton police recover three stolen bikes off campus. A San Diego cyclist’s life was changed forever by the alleged stoned driver who plowed into a group of riders on Fiesta Island last year. Oceanside’s Strand will be widened, including a shoulder for cyclists and pedestrians, only 35 years after it was damaged in a storm. San Francisco’s Sunday Streets visits some of the city’s sketchier neighborhoods in the Tenderloin. A Sacramento bike advocate says the city is lagging behind in planning for bicycles. A distracted driver killed a Sacramento father and critically injured his eight-year old son as they rode their bikes; the 25-year old driver was reading a text message when he drove into the bike lane they were in. Tragically, the victims were refugees from war-torn Afghanistan, and had only been in the city for a few weeks. No Trespassing signs go up on a Modesto bike and pedestrian trail, presumably by mistake. Redbook suggests riding a bike together could make you fall in love all over again. My hometown considers joining other Colorado city’s in embracing bikeshare; the city already enjoys a successful bike lending library. Someone apparently deliberately rigged a truck to crash into an Oklahoma bike shop. Tragic news from Minnesota, as a small town ambulance crew responds to a bicycling collision, and finds their own boss fatally injured. Fifteen-hundred cyclists ride 160 miles across the state of Indiana. Connecticut bike riders no longer have to ride as far to the right as practicable, only as far to the right as they deem safe. We so need that wording change here. New York is working to improve safety by reducing left turns. Banning left turns on busy streets would improve safety in LA, while allowing the near-ubiquitous center turn lanes to be reconfigured to make space for bike lanes. And yes, it is possible to avoid a left turn and still get where you’re going by just driving around the block. The NYPD has issued a BOLO Alert for the hit-and-run bike rider who critically injured pedestrian last month. A Winnipeg paper calls for approval of the city’s proposed bike and walking plan, despite the overt objections of some city councilors. Londoners react to the latest subway strike by doubling usage of the city’s bikeshare system. A new Brit bike satnav system attaches to your handlebars and lights up to indicate where to turn. Once again, UK police stop a “silly cyclist” from riding on a major highway. A British soldier tracks down the thief selling his stolen bike on Ebay, and finds the trail leads to a fellow soldier in his own barracks. Oops. No offense, but who would confront 25 angry teenagers to stop a bike-jacking? Props to this British man for trying, but seriously, when you’re outnumbered 25 to three, just let the damn bike go, already. Copenhagen may be a bicycling paradise, but it’s also a popular spot for bike thieves; a bike shop owner was arrested after being caught with hundreds of hot bikes. Israel will construct a nearly 100 mile bicycling network, including 10 cycling expressways. A writer for the New York Times gets busted for borrowing a bike from Japan’s unofficial bikeshare. Bangkok officials clean up the streets to prepare for a bike event in honor of the queen’s birthday. Talk about crappy customer service; a Utah bike shop employee decks a deer that wandered into the shop. You can get Audi’s new limited edition racing bike, as long as you’re willing to travel to Dubai. And not a deer, presumably. And a Kiwi website offers advice on how to deal with the bike haters on social media. I hope the Vision Zero plan will include a multi-agency long term task force to do the kind of dogged follow-up on each bike and pedestrian death, not only for a pattern overview but to track the details of what went wrong at each site, as exemplified by this blog. Justy change the law and make BMUFL signs redundant. Make passing a bike in the same lane simple assault, and hitting a cyclist or pedestrian assault with a deadly weapon. Can someone be able to get a Freedom Of Information Act request for the dash cam of the officer in question? Though I’m not sure the camera is running continuously. 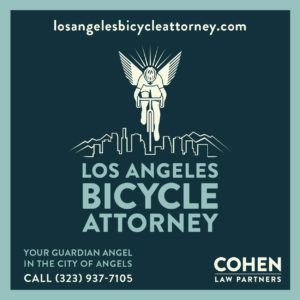 I hope one of those lawyerly-type cyclists can get that Glendora dash cam and make it public. CHP informed that dash cam only runs when lights are flashing. Since CHP didn’t pull anyone over, there’s no video footage. We all need Go Pro’s.